Ever wondered what would happen if a marshmallow Peep was exposed to the cold, uncaring, probably Easter-hating vacuum of space? Of course you have. Slate brings us this landmark moment in science straight from Texas A&M's Physics and Engineering Festival. Experimenter Phil Plait noted that Peeps—with their puffy little bodies, dead eyes, and very nearly negative nutritional value—wouldn't make the best astronaut food, but they'd probably be super fun to just, you know, fling into space. So he replicated the effect here on good ol' terra firma. Watch and be enlightened. Much funnier than what would happen to a person, which... yikes. Let's just say it'd be even worse than that one scene from Event Horizon (warning: probably NSFW). 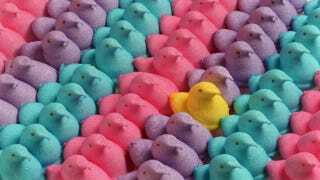 Now I just want to see Event Horizon, only with the entire cast replaced by Peeps. Make it happen, Hollywood.